Last year, Majority Leader Mitch McConnell, R-Ky., announced shortly before the Senate adjourned for the holidays that he and Minority Leader Chuck Schumer, D-NY., agreed that the Senate would not consider any legislative proposals related to the border wall or to reopen the government until “the President and Senate Democrats have reached an agreement” to end the shutdown. Given that Senate action is required to reopen the government, with or without border wall funding, the McConnell-Schumer agreement to shut down the chamber has helped to make the 2018-2019 shutdown the longest in American nation’s history. Throughout the drama, Republicans and Democrats have studiously avoided taking any action in the Senate that could help them achieve their putative goals. Yet the Senate’s persistent inaction throughout the shutdown appeared to come to an end yesterday when McConnell and Schumer agreed to schedule side-by-side votes on majority- and minority-sponsored amendments to reopen the government, with and without border wall funding, that, in effect, need 60 votes to pass. The details of the McConnell-Schumer maneuver highlight an apparent agreement between the two leaders to prevent rank-and-file members in both parties from acting independently on the Senate floor to achieve their goals. Specifically, McConnell asked unanimous consent that the Senate move to proceed to the Supplemental Appropriations Act of 2019 (HR 268). HR 268 provides $12.1 billion in supplemental appropriations to various federal departments and agencies to fund programs related to recent disasters. The legislation passed the House on January 16 by a vote of 237 to 187. McConnell needed consent to make a motion to proceed to HR 268 because the pending question at the time was the motion to proceed to the Strengthening America’s Security in the Middle East Act of 2019 (S. 1). The Senate’s precedents stipulate that “while a motion to take up a matter is pending, a motion to proceed to the consideration of another bill is not in order.” Consequently, a motion to proceed to HR 268 was out of order as long as the motion to proceed to S. 1 was pending before the Senate. After obtaining unanimous consent to take up the motion to proceed to HR 268, McConnell then, in effect, asked the Senate’s Presiding Officer to call for a vote on the motion. The Senate subsequently adopted the motion to proceed to HR 268 by voice vote. That vote made HR 268 the pending business before the Senate. McConnell then offered an amendment (Amendment Number 5) on behalf of Richard Shelby, R-Ala., to HR 268. The Shelby amendment would strike the text in the underlying legislation and replace it with a proposal to reopen the government and appropriate $5.7 billion in border-wall related funding. The amendment would also codify the Deferred Action for Childhood Arrivals (DACA) program on a temporary basis and make several changes to the government’s asylum policies. Schumer then asked unanimous consent that the Shelby amendment be set aside and that he be allowed to offer an alternative proposal (Amendment Number 6) to reopen the government for three weeks without funding the border wall. McConnell set up the amendment tree depicted in Chart 3 when he offered the Shelby amendment to HR 268. 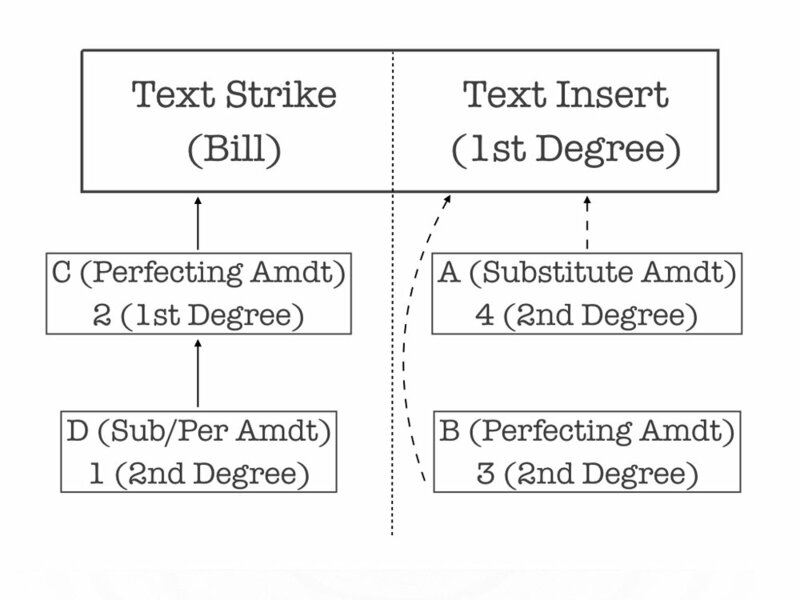 Schumer set up the modified amendment tree depicted below when he obtained McConnell’s consent to set aside the Shelby amendment to offer his own proposal. McConnell then asked that it be in order to file cloture on both amendments during Thursday’s session of the Senate and that the cloture motions, if filed, be treated as if they were filed during Tuesday’s session. McConnell also asked consent that the cloture motions, if filed, ripen at 2:30 pm on Thursday. At that point, the Senate would vote on the cloture motions in the order in which their underlying amendments were filed (i.e., first on the Shelby amendment and then on the Schumer amendment). McConnell then asked unanimous consent that the Senate resume consideration of the motion to proceed to S. 1. In doing so, he effectively prevented senators from offering their own proposals to either the Shelby or the Schumer amendments. The McConnell-Schumer agreement to resume consideration of the motion to proceed to S. 1 signals that the two leaders are using it to block unauthorized floor action. It will likely remain the pending business until Thursday when, or if, McConnell files cloture on the Shelby and Schumer amendments pursuant to the consent agreement. Had the McConnell-Schumer agreement instead kept HR 268 before the Senate, any senator could have offered an amendment to either the Shelby or Schumer amendments in branches A or B. Senators could have also offered amendments to the underlying legislation in branches C and D on the left side of the tree.